Intel is finally doing the right thing in the SFF PC market with a new motherboard concept shown at CES. SemiAccurate welcomes this ray of sanity into a market for which it is long overdue. You may recall that up until this point Intel features the lovable NUC as their point product in the SFF/set-top market. Sure there were a few extremely minor rough spots on NUC but they were quickly polished off to make the perfect TV companion product. What more could they possibly do to make things palatable for the user? 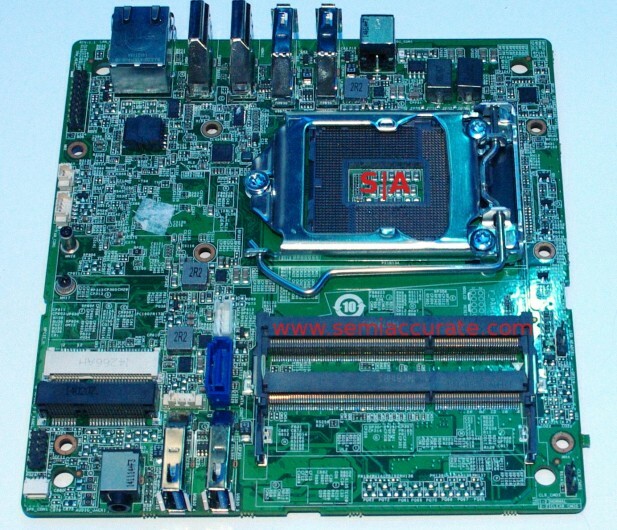 How about throwing everything out and doing the right thing as is shown by this prototype motherboard. For the moment this 5.5″ x 5.5″ board does not have a name be it a snappy marketing one or actually sensible. We consider this a good thing for the moment but will probably suggest “BTX” to the good folk in marketing at the next opportunity, that sounds like a surefire winner doesn’t it? Jokes aside this form factor makes a huge amount of sense. To start out with it is only .78L with a full SSD making it the smallest socketed system out there that we know of. It will support up to 16GB of DDR3L, an M.2 SSD and 2.5″ HD, 4x USB 3.0 2x HDMI, GbE, audio, and Wi-Fi. In short it is a complete socketed system that avoids everything the NUC stumbles into, turned around, and ran into again. A socketed system 28% smaller than ITX is long overdue. Since it is so early the concept isn’t even named there aren’t details like price or release date to share yet but given the state of things says we might see a few at Computex. Given the size and features it probably has a pretty high layer count so the cost should be high but tempered by the area. We will take a mildly educated guess and say that it should be around the cost of a full-sized board. That means you could make a system based on it for about what you could make a standard desktop for.